The Carissima appeared in Germany in 1934. 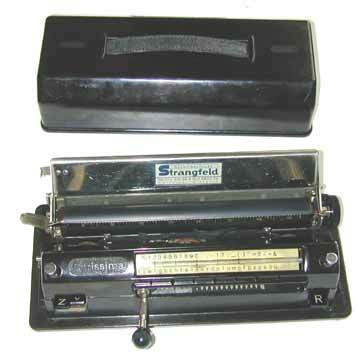 It was a simplified, index version of the Junior (later Bennett) typewriter that had appeared in the USA in 1908. However, in line with the atmosphere of the day, the machine was literally promoted in Germany as "an achievement of the German genius". The Carissima is a linear index machine with two shift buttons on the front left of the machine and a backspace key on the front right. The handle that is used to move the index pointer can be folded in to allow the cover to be put over the machine. The frame, typewheel, ribbon spools and cover of the Carissima were made out of bakelite (described in the brochure as "insulation steel"). Pictures 3 and 4 (top) show the resemblance in size and principle between the Carissima and the Bennett. The movement and left margin stop of the carriages are identical and so is the principle of the typewheel by which both machines were operated. But where the Bennett had a very clumsy keyboard, the Carissima used an index. A 1930s French Swiss ad for the Carissima. Click the image for a larger version. Nevertheless, a brochure for the Carissima proudly proclaimed that this German invention was the first typewriter in history that was not only practical, but also affordable for everybody and made of German materials and with German labor. A true achievement. At this point it is unclear when production of the Carissima ended, but the machine is regarded relatively rare.